Spitfire Mk. Vb of No. 453 Squadron RAAF undergoing maintenance, Autumn 1943. The place is most probably Perranporth, Cornwall, indicated by the proximity of the sea and the magnificent cliffs in the background. No. 453 Squadron was stationed there between 20th August and 15th October, 1943 as part of 10th Group. No. 453 Squadron was formed in New South Wales in May 1941 and gained its initial fame by defending against the Japanese onslaught in Malaya and Singapore, fighting on obsolete Brewster Buffalos. Following the fall of Singapore, the unit was disbanded, only to be formed again in Scotland with new personnel in June 1942. It operated Spitfires Mk. 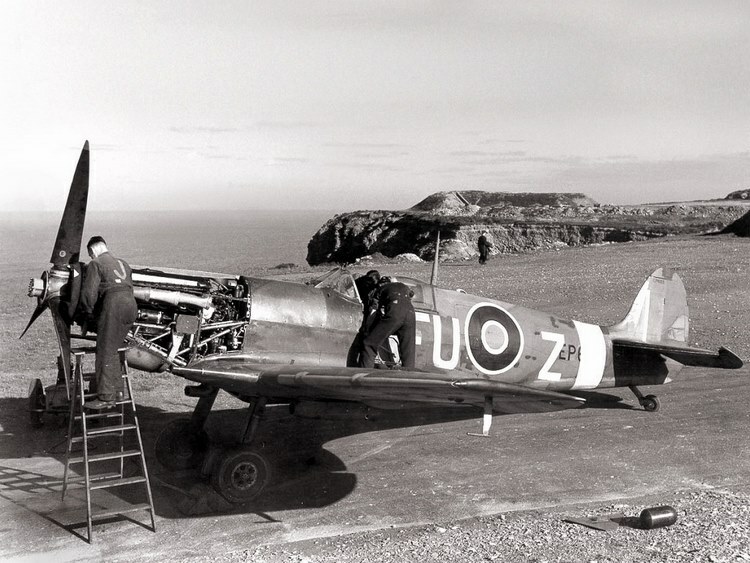 V.
The period spent in Perranporth brought the squadron’s greatest single-day combat success. On the offensive sweep near Brest, seven Spitfires of the unit led by Sqn/Ldr D.G. Andrews engaged eight Messerchmitts Bf 110 flying low over the water. Five enemy aircraft were shot down to the loss of one Spitfire. Your Comment regarding the likely location being RAF Perranporth, I agree. I live very close to this airfield and visit it regularly. oddly enough, a print of this photograph is available on e-bay from Perth Australia! The vendor suggests Dover cliffs, but because I recognise the DoubleBlast pen location behind the Spitfire made me research the photograph on the web’, your article agrees with my recognition!